Hey Parents, it's almost that time for back to school shopping. Well, guess what. 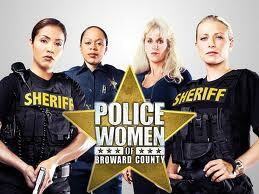 The Broward Sheriff's Office wants to save you a bit of money. So, before you go out and purchase new backpacks and supplies for your elementary, middle, or high school student make sure you join BSO on August 20, 2011 at 11:30am - 3:30pm at Westside Regional Park located 445 SW 2nd Street in Deerfield Beach. They will not only be giving away backpacks filled with school supplies, but also there will be free food, refreshments, cotton candy, and to beat the heat snow cones. 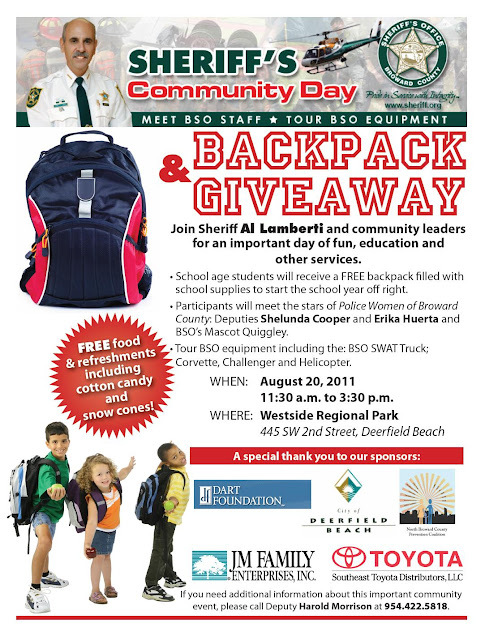 Shelunda Cooper and Erika Huerta of Police Woman of Broward County will also be there, so make sure you make plans to bring the entire family out to BSO's Annual Community Day (Brought to by Sheriff Lamberti). For more information contact Deputy Harold Morrison at 954-422-5818.